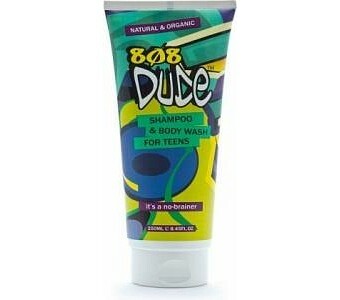 Cut your shower time into half with 808 Dude Organic Shampoo & Body Wash for Teens. Its dual-action cleansing sensation is suitable to wash your hair and whole body in just a few minutes. Better than your regular soap, 808 Dude Shampoo & Body Wash leaves your skin and hair feeling refreshed and smelling super good. Made with certified organic ingredients 808 Dude Shampoo & Body Wash for Teens is suitable for all skin types Works as a shampoo and body wash in one bottle Better than your average soap, because it doesn?t dry out your skin Ingredients: Aqua, Aloe Barbadensis (Aloe Vera) Extract Organic, Lauryl Glucoside, Cocamidopropyl Betaine, Decyl Glucoside, Sodium Cocoyl Glutamate, Certified Organic Glycerine and Aqua and Certified Organic Eleutherococcus senticosus (Ginseng) and Naticide, Aqua and Glycerin and Paullinia Cupana Seed Extract (Guarana) and Citric Acid and Sodium Benzoate, Hydrolyzed Wheat Protein, Panthenol, Citrus Aurantium Bergamia (Bergamot) Oil, Citrus Grandis (Grapefruit) Peel Oil, Pogostemon Cablin (Patchouli) Oil, Citrus Aurantfolia (Lime) Oil, Citrus Nobilis (Mandarin Orange) Oil, Juniperus Virginiana (Cedarwood) Bark Oil, Rosmarinus Officinalis (Rosemary) Leaf Oil, Coriandrum Sativum (Coriander) Oil, Glyceryl Caprylate, Potassium Sorbate.